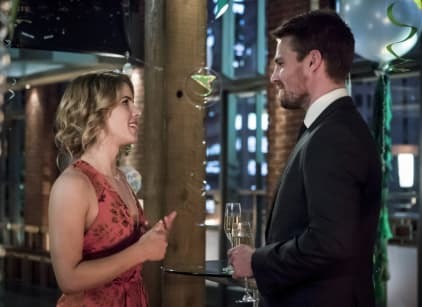 Oliver reveals to Thea that he's going on a date with Felicity for his birthday. That night, he returns home and finds the door ajar. He is then greeted by everyone for a birthday party. They quiz where Rene and Dinah could be. Curtis stops by Dinah's home and is kidnapped. In flashbacks, Kovar ties Oliver up, but Oliver claims he is going to kill him. Oliver tells Felicity it's all his fault. They try to find the truth and find out Black Siren is out of her cage at Argus. Black Siren shocks Quentin by dressing as Laurel. Thea tries to overpower her, but Artemis shows up. Oliver tells Felicity and Diggle to leave and not tell him where they are going. They are caught by the league of assassins. Oliver bumps into Malcolm who apologizes for everything and says that his only concern is saving Thea. Oliver arranges Chase's transfer, but Chase says that as soon as he gets on the chopper, Oliver's friends would be killed. Olver gets a video sent to him of William. Malcolm helps Oliver get Chase out of custody, but Chase says Oliver broke the deal. Chase takes them all to the island and refers to Thea as "sister."